Waterproof to IPX-6, HP25R headlamp is prepared for the challenge of all weather use. A battery level indicator is also built-in. Fenix HP25R performance Overheat protection cuts in at 65 centigrade, reducing output until HP25R cools down. Description: Featuring a Micro USB port for go-anywhere charging, the HL60R Headlamp delivers a maximum output of 900 lumens, beam throw of up to 116 meters and runtime of up to 100 hours from just one 18650 Li-ion battery. This feature-rich headlamp is equipped with neutral white LED for better color rendering, a side switch to activate five output modes and a red light alert mode. The HL60R all-season headlamp is designed with aluminum housing, and is complete with the ANSI IPX-8 waterproof classification, it’s surely the first choice when you climb high altitudes, do cave exploration or in backcountry. Features: . Description: HP30R is a headlamp with separate battery case, powered by two 18650 Li-ion batteries. The belt-worn battery case reduces the load bearing of user’s head and maintains optimal performance in cold areas. This headlamp is rechargeable via the Micro USB port in the battery case, and the battery can be used as a power bank. Featuring four white spotlight output levels, and four neutral white floodlight output levels, the spot- and floodlight can be switched on simultaneously to deliver a max output of 1750 lumens, runtime of 400 hours and a far-reaching beam of 202 meters. The HP30R will be an indispensable aid in your mountaineering, searching, snow-hiking or any other challenging outdoor activities. Feature: * Uses Cree XM-L2 . Another high value, high quality, superb performance lighting product from Fenix that's sure to be hugely popular with outdoor adventurers. If there's a problem, just let us know and we will fix it. The HL60R all-season headlamp is designed with aluminum housing, and is complete with the ANSI IPX-8 waterproof classification. o 1 x USB charging cable. o Side & top headbands and spare o-ring. o Toughened ultra-clear glass lens with anti-reflective coating. Introduction: Besides an optimized size, Fenix HP15 ultimate edition features a dedicated switch that makes 900-lumen burst mode directly accessible even if the light is off. With six outputs including SOS, rugged aluminum chassis and IPX-6 waterproof rating, this headlamp is a reliable tool for mountaineering, searching, caving and more. Specification: Size: 67.4*55.9*34.7mm (2.7’’×2.2’’×1.4’’) Battery case size: 88.8mm × 73.7mm × 26.2mm (3.5’’×2.9’’×1’’)Utilizes Cree XM-L2 (U2) LED with a lifespan of 50,000 hours Uses 4x AA batteries, either Ni-MH or AlkalineDigitally regulated output maintains constant brightness&n. NOTE The HL55 is not supplied witht a battery. Descriptions: Ultra compact design and powered by CR123Abattery, the 2-meter submersible all-weather HL50 headlamp helps you reach new heights in your outdoor adventures. The Fenix HL50 headlamp features 365 lumens neutral white output and the ability to use either CR123Aor AA batteries. You can also pop the lighting head out for handheld or keychain use with the always-ready HL50. Features: . Introduction: Besides an optimized size, Fenix HP15 ultimate edition features a dedicated switch that makes 900-lumen burst mode directly accessible even if the light is off. With six outputs including SOS, rugged aluminum chassis and IPX-6 waterproof rating, this headlamp is a reliable tool for mountaineering, searching, caving and more. Specification: Size: 67.4*55.9*34.7mm (2.7’’×2.2’’×1.4’’) Battery case size: 88.8mm × 73.7mm × 26.2mm (3.5’’×2.9’’×1’’)Utilizes Cree XM-L2 (U2) LED with a lifespan of 50,000 hours Uses 4x AA batteries, either Ni-MH or Alkaline (included battery)Digitally regulated output maintains co.
Model: HL40R. 1x Fenix HL40R Headlamp. With the design of rotary focusing between spot- and floodlight, it perfectly satisfies up-close and far-reaching lighting demands. Cree XP-L HI V2 white LED, with lifespan of 50,000 hours. Description: HP25R defines extreme versatility. It features not only recharging capability, but also the handy combination of neutral white floodlight and far-reaching spotlight. However complex the environment may be, HP25R responds with impressive performance, whether it is in hiking, camping, searching, cave exploration and more. This user-friendly headlamp has a battery level indicator, and a micro USB port allows charging when your 18650 battery lets you down. Features: . Description: HM50R is a rechargeable headlamp, built tough to withstand cold temperatures. It is fitted with a white light LED featuring 4 output levels. The side switch in the lamp head controls all functions and is easily operated for various lighting demands. The lamp emits a max output of 500 lumens with a max beam distance of up to 80 meters, and a max runtime of 128 hours. 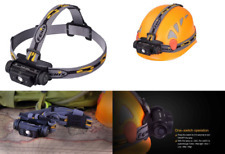 All of the following features: IP68 rating, cold-resistance, full-metal housing, semi-sealed holder(headlamp holder can be removed), sweat-channeling headband, compatibility with 16340 and CR123A batteries, handy and compact size, plus the ability to use the headlamp as a mini flashlight, make this multipurpose headlamp really suitable for high altitude climbing and long distanc. Feature: *HL40R is an all-round rechargeable focusing headlamp which emits a max output of 600 lumens. *Made of quality plastics and aluminum. *Cree XP-L HI V2 white LED, with lifespan of 50,000 hours *With the design of rotary focusing between spot- and floodlight , it perfectly satisfies up-close and far-reaching lighting demands. *Micro USB port, fitted with a built-in 2000mAh Li-polymer battery and 4 charging and discharging indicators, HL40R is remarkable in runtime and user-friendliness. ALL NEW FENIX HL60R HEADLAMP. HERE WE HAVE THE ALL NEW FENIX HL60R HEADLAMP. THE NEW FENIX. THIS FEATURE RICH HEADLAMP IS EQUIPPED WITH NEUTRAL. Although the HP30R can be life saving tool to search and rescue professionals; it’s easy to use and affordability make it ideal for adventurists at all levels. Includes: Fenix 3.6V 2600mAh 18650 Li-ion battery, spare o-ring, micro USB cable. Floodlight Mode. Introduction: Rugged Aluminum housing and waterproof construction, the IP68 rated HL23 adventure proof headlamp is ready for anything you can throw at it. Armed with a powerful Cree XP-G2 LED, this one AA battery powered headlamp provides 150-lumen output with 55-meter beam distance. Featuring three brightness levels, HL23 is a great choice for your nighttime adventures. Specification: Size: 71*38.9*40mm(2.79" ×1.53"×1.57")Battery: Uses one AA (Ni-MH, Alkaline) battery (included battery)Digitally regulated output maintains constant brightness60 degree tilt mechanism Fast, convenient all-in-one button switchReverse polarity protection guards against improper battery installationMade fro. Description: Fenix HL26R is an ultra lightweight rechargeable headlamp specifically designed for trail running. With built-in rechargeable Li-polymer battery, it can be charged through Micro USB port. Featuring spotlight and floodlight, dual switches for fast operation, plus IP66 rated structure and fully reflective headband, the HL26R is competent for the complex environments of trail running and long distance hiking. Features: * Uses Cree XP-G2 R5 white LED and Nichia white LEDs with a lifespan of 50,000 hours. * Built-in 1600mAh Li-polymer battery. * Micro USB rechargeable. * Digitally regulated output maintains constant brightness. * Overcharging and over-discharging protection to protect the battery and circuit from damage. * Spotlight and flo. 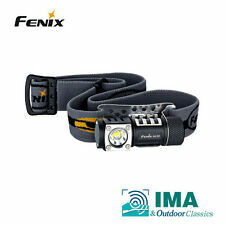 Description: The Fenix HL15 is a lightweight running headlamp. It is equipped with a reflective headband, one neutral white LED for better color rendering, and two red LEDs to alert others. Featuring four brightness levels plus IP67 waterproof classification, the HL15 is perfect for road running, hiking, camping etc. Features: * Utilizes Cree XP-G2 R5 neutral white LED and Nichia red LED with a lifespan of 50,000 hours* Powered by two AAA(Ni-MH/Alkaline) batteries (not included)* Digitally regulated output maintains constant brightness* 60-degree tilt mechanism adjusts the beam when needed* Two independent switches, can be used simultaneously* Reverse polarity protection, to protect from improper battery installation* Made of durable airc. You can also pop the lighting head out for handheld or keychain use with the always-ready HL50. ·Uses one 3V CR123A Lithium battery or AA (Ni-MH, Alkaline) battery. Utilizes Cree XM-L2 T6 neutral white LED with a lifespan of 50,000 hours. Fitted with a powerful LED, the TK75 2018 torch provides the ideal lighting solution for applications such as search and rescue, caving and trekking. The Fenix TK75 2018 UE features a dual switch system, which consists of a master and auxiliary switch. 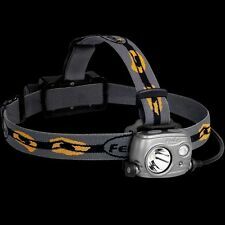 Fenix HL15 Lightweight Running Headlamp Head Torch Condition is New. Dispatched with Royal Mail 1st Class. This is an accessory for Fenix flashlights which own outstanding filtration ability to maintain strong red, blue, or green light, and it could be used as signal lamp or weft when necessary. ---Uses toughened ultra-clear glass lens with anti-reflective coating that provides heat resistance and maximum light penetrability ---Anti-roll design ---Easy to attach/remove ---AOF-S filter lens compatible with PD35 / PD12 / UC40 / UC40 ultimate edition. The switches can be locked out by the user to prevent accidental operation by pressing both switches for 3 seconds to lock, and repeating the process to unlock the headlamp. Battery Power "Fuel Gauge". LED Lenser has further refined the strengths of the original H7 model and combined further practical functions in the new LED Lenser H7.2. Introducing the new LED Lenser H7.2 head torch. further refined the strengths of the original H7 model and combined further practical functions in the new LED Lenser H7.2. Description Featuring a Micro USB port for go-anywhere charging, the HL60R Headlamp delivers a maximum output of 900 lumens, beam throw of up to 116 meters and runtime of up to 100 hours from just one 18650 Li-ion battery. This feature-rich headlamp is equipped with neutral white LED for better color rendering, a side switch to activate five output modes and a red light alert mode. The HL60R all-season headlamp is designed with aluminum housing, and is complete with the ANSI IPX-8 waterproof classification, it’s surely the first choice when you climb high altitudes, do cave exploration or in backcountry. Features: Features. The ATEX-H2 is Industrially solid. The Unilite ATEX-H2 – Zone 0 Intrinsically Safe Headlight. We use DPD to send all our parcels. Features: Belt-Worn Battery Pack Micro USB Charging and Discharging Easy Switch between Spotlight and Floodlight Battery Level Indicator Floodlight with 90° Wide Beam Angle 60° Tilt Mechanism for Beam Direction Specifications:. The Fenix UC01 is a mini rechargeable light with micro USB port making it an ideal keychain light. Clip the UC01 on your clothing, gear, or anywhere you need quick access to. It contains a high-performance LED which delivers max 45 lumens and max duration of 50 hours at Low output. The three simple output levels are all controlled by the one stainless steel side switch. With the addition of IPX-6 waterproof ability, the Fenix UC01 is completely competent for daily use, outdoor hiking. The long-awaiting HP25R is released. Need a headlamp for a challenging environment? The Fenix HP25R is ready to partner with you. The HP25R is extremely versatile in that it is USB rechargeable but will also run on two standard CR123A non-rechargeable batteries when in remote locations. Added versatility is the combination neutral white floodlight as well as a far-reaching spotlight--up to 1000 Lumens and 614 feet. The HP25R performance is not diminished in harsh conditions, whether hiking, camping, hunting, searching, spelunking or whatever your journey may be. Take the new HP25R into your environments and be impressed by its performance. You will continue to be amazed by Fenix products. Specifications. Features: Digitally regulate output maintains constant brightness Red light for night vision Red flashing mode for emergencies 60 Degree tilt mechanism directs the beam where needed One switch control for fast, easy operation Reverse polarity protection to protect from improper battery insertion Intelligent overheat protection protects from high surface temperature Made of quality aluminum and plastic CPSIA and REACH certified Secure locked battery pack - great for kids! ​Specifications:. Yes, the demand has been there--a small, compact, cool, low-priced, high-quality headlamp. Well, Fenix has delivered. The Fenix "Colorful Night Elf" is a mini-portable multi-functional headlamp with a maximum Lumen output of 8 lumens. The HL05 goes beyond its limited body size. Measured at only 13 grams of weight, the HL05 features 4 output modes, including flashlight red light, which deliver up to 280 hours of illumination. This versatile lighting source can be worn on the head or clipped on a backpack or hat. You will find you use this little jewel more than imaginable.